played lead guitar on some AC/DC tracks. A few days ago, sadly, I had to update this to “Malcolm Young’s doppelganger replaces him in AC/DC” after the band’s management announced on 2 October, that Malcolm, as most people expected, has dementia. As too many will know through personal experience, dementia is a loss of brain function affecting your memory, judgement, thinking, language and behaviour. It generally afflicts those over 60 with the risk increasing as you age. At just 61, Malcolm Young must be considered particularly unlucky to be diagnosed so young. Dementia strikes without fear or favour, regardless of class, race or intellect. Politicians to have suffered from the condition include Winston Churchill, Ronald Reagan and Margaret Thatcher. Musicians with dementia include hokum blues and gospel pioneer Georgia Tom, crooner Perry Como and, more recently, country music’s Glen Campbell. Now that Malcolm Young has joined them, the tributes are, of course, flowing in. 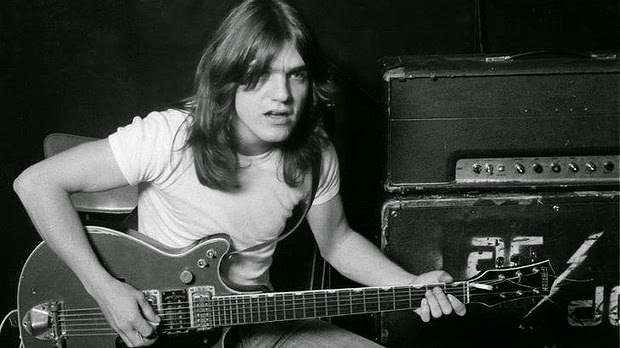 Malcolm, after all, is regarded as one of the greatest rhythm guitarists in the world. The latest accolade comes from Guns N’ Roses lead guitarist, Slash, supporting US band, Train, at Australia’s Rugby League Grand Final curtain-raiser in Sydney over the weekend. Backing this, Guitar Player magazine once said the secret to Malcolm Young’s guitar technique is playing open chords through a series of medium-sized amplifiers set to low volume with little or no gain. This is contrary to the common belief of many rock guitarists that rhythm guitar should involve loud and over-driven power chords through large amplifiers. “Malcolm was a key songwriter for the band as well,” said Slash. “He wrote those great rock & roll pop songs that came across in a dark and dirty way.” Such songs, of course, include AC/DC classics, “Dirty Deeds Done Dirt Cheap”, “Riff Raff” and “Let There Be Rock”. 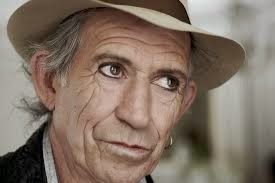 Slash, for the rock-trivia-minded, has known Keith Richards and the Rolling Stones since Slash was a child. Then known as Saul Hudson, Slash was born and lived in Stoke-on-Trent, England, the same town Lemmy from Motorhead hailed as does popster, Robbie Williams. When Slash was five he moved to Los Angeles with his English artist father to join his African-American costume designer mother. As Ronnie Wood and Slash discussed on Ronnie’s UK radio and TV show, the Stones were often at Slash’s parents’ house (where Ronnie was always the most friendly of the visitors). family all looking so similar, who can be sure? Slash also told how he hung with another immigrant kid in LA: Flea, bass player with the Red Hot Chilli Peppers, an Aussie from Melbourne called Mike Balzary. But back to AC/DC founder and engine-driver Malcolm Young’s retirement. As reported in May, the massive hole left by the guitarist has been filled by his nephew, Stevie Young. 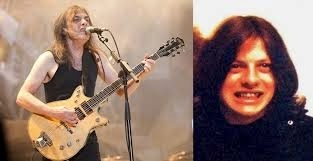 The son of Malcolm and Angus Young’s elder brother, Steven, 57-year-old Stevie Young is said to be Malcolm’s physical and musical double. Born in Scotland like his uncles and father, Stevie Young’s rock pedigree includes Scots bands Stabbers, Prowler and Tantrum, and new wave English heavy-metal band, Starfighters, from Birmingham. Stevie’s also had albums produced by Uncle Malcolm and stood in for him on rhythm guitar during AC/DC’s 1988 tour to promote their ‘Blow Up Your Video’ album. Such was the resemblance, most fans were said not to notice the difference. In April (2014) Stevie formed a blues band called Blue Murda with his son, Angus Young, (great nephew of AC/DC icon, Angus Young). Stevie Young replaced his uncle on the band’s latest album, “Rock or Bust”, due out on 2 December 2014 and will promote the album during AC/DC’s world tour next year. Update July 31 2017. As Malcolm continues to deteriorate from this disease which has no cure, understandably there have been no updates from either family of band. Malcolm was rumoured to have suffered a stroke in 1914. His replacement in AC/DC, Stevie Young, said he wasn’t trying to imitate Malcolm’s playing style but trying hard to keep his spirit alive. Thanks for your feedback 76Joyce. I will certainly check out Mertiso’s tips for better traffic. I need it.